Here are thirteen of my favorite ABC apps. They vary in style but they are all nicely done. All thirteen were free when I downloaded them but only four are currently free. Sign up to receive my blog via email so that you don’t miss out on good FREE apps! I only write about apps that I would recommend. Enjoy!! Once named an Editor’s Choice in the app store, Endless Alphabet is currently $6.99 but it occasionally goes on sale. 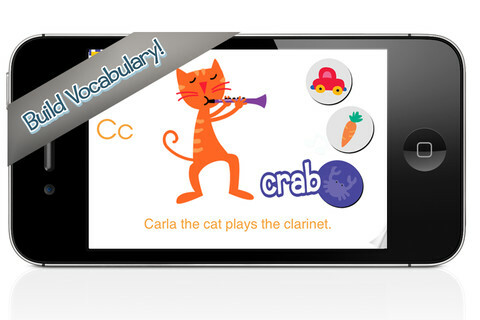 This adorable interactive app combines learning letters & their sounds with learning vocabulary. There are currently 26 words featured in this educational app – one for each letter of the alphabet. But the app promises to be truly endless with new words to be added. Kids tap a letter and its word appears of the screen. Then silly monsters come by and knock it over. Kids work to reconstruct the word with animated, talking letters. To teach the meaning of the word, there is also a short animation included. 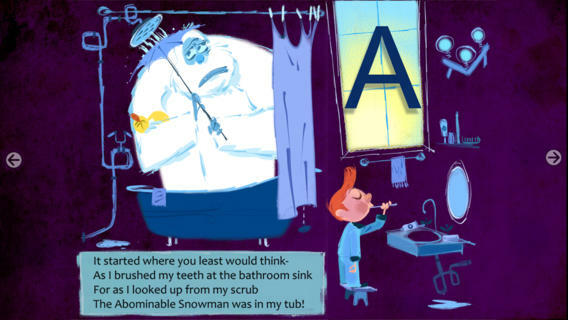 Words featured include: bellow, cooperate, gargantuan, portrait, quarrel – clearly not words found in the average ABC book. The vocabulary development in this app makes it appropriate for a wide range of kids. Love this app – it’s silly, fun, and educational. My friend’s grandson learned all the letters and sounds of the alphabet because he loved this app so much. 🙂 It’s super cute!! Currently $2.99 – AlphaTots Alphabet, a GREAT ABC app for kids! What makes this educational app unique is that it uses 26 action words to teach the alphabet. Kids are asked to complete 26 interactive tasks, for example: b – build a robot, p – play instruments, z – zap alien spaceships, etc. This app has been featured on The Today Showand has received a lot of positive press. It is a VERY fun app for toddlers/preschoolers who are learning their alphabet!! Currently $2.99 – Word Wizard – Talking Movable Alphabet. This educational app features advanced text to speech capabilities to help kids with reading and spelling. Emergent readers can utilize the phonics movable alphabet to explore and play with words and sentences. As they do so, the app pronounces and spell-checks their work. Consonant letters are blue and vowels are red – helping kids to become aware of the differences. The short pronunciation of the vowels is featured as the letters are moved onto the board. Once a word is spelled, the app changes the vowel’s pronunciation for that word if necessary. If a word is not recognized by the app, it is still pronounced (according to the rules of phonics) but it is highlighted in red. How cool is that?! Currently $3.99 – Kids Academy · ABC Alphabet Phonics App HD. This educational app has two sections: animated flashcards (to teach kids the letters/sounds) and traceable worksheets (to teach kids how to write the letters). 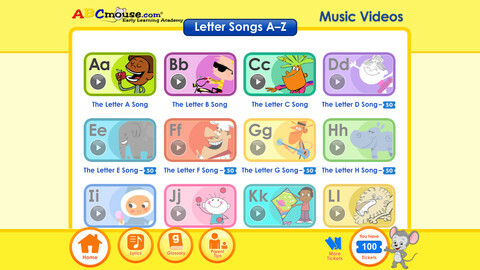 The flashcard section has cute animations to teach kids letters & sounds in a fun way. The writing section has two modes (right-handed and left-handed) to teach upper and lower case letters. The app is designed to have multiple users and parents can track their children’s progress. Nicely done!! K.RF.1 – Demonstrate understanding of the organization and basic features of print. Recognize and name all upper and lowercase letters of the alphabet. Currently $2.99 – Interactive Alphabet is one of the best alphabet apps that I have seen for babies, toddlers, & preschoolers. It’s so cute and well designed! To start you choose an accent (American or British) and a mode. It has 3 modes for your developing child – baby, explore, and trace. The baby mode takes your child on a guided, touchable tour of the alphabet. 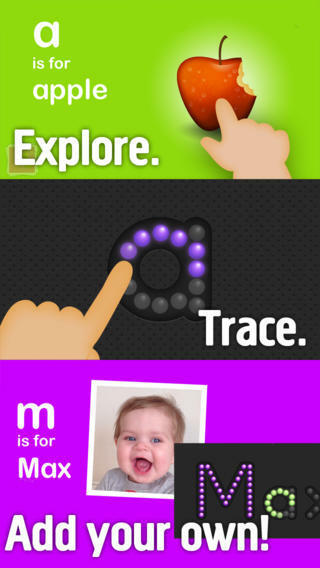 The explore mode lets children discover the sights & sounds of the alphabet at their own pace. It features fun activities that kids will want to explore multiple times. In the trace mode, kids learn to properly trace letters (lower case, upper case, or mixed) and words. The app keeps track of your child’s progress by starring the letters & words that are traced most often. 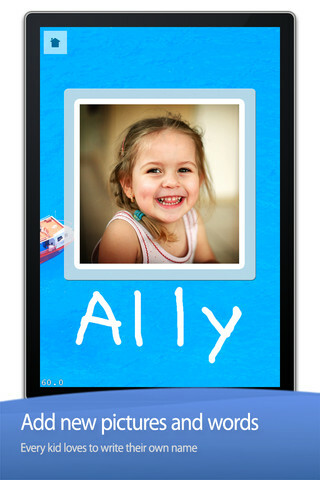 The app can also be personalized by adding your own words and pictures. Your child can learn to trace his/her own name as well as the names of other family members, family pets, etc. 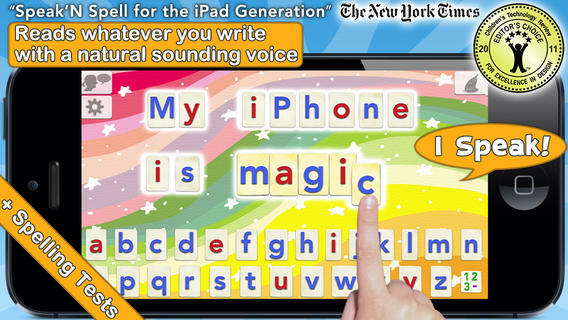 This educational app truly lays the foundation for reading and spelling! Fabulous – this developer seems to have thought of everything! FREE again – Little Writer is a letter writing app for the iPhone/iPad that is designed to teach 3 – 6 year olds how to write upper & lower case letters, numbers, shapes, and words. It starts by showing the shape of the letter and naming it. The child traces along lines to write the letter. Then the child is praised and told what letter, number, shape or word he/she has just written. When writing a word, the letters are presented one at a time with the full word shown in the upper right-hand corner. When the word is finished, a picture pops up with the child’s writing underneath it. K.RF.1 – Recognize and name all upper and lowercase letters of the alphabet. Currently $1.99 – Drawnimal, an ABC app for kids that has them thinking (and drawing) outside the box. Kids begin by placing the device on a piece of paper or other drawing surface. Then they draw around the device (as shown above) to complete the drawing of an animal. When they press play, the app identifies the animal. Finally, they tap the animal for a delightful surprise! Kids will love the animal animations that they helped to create. It’s the perfect combination of an alphabet app and a drawing app for little ones. And, it’s in 5 languages – English, Spanish, Dutch, Italian, and French. It’s super cute and super fun! FREE again – My A – Z, a fully customizable alphabet app. Using this educational app, you can easily create alphabet flashcards for your kids with personal pictures and personal recordings of up to 30 seconds! The app comes with words & pictures for each letter of the alphabet but you have the ability to edit those and/or add your own. Just use already existing photos from your photo albums or use your device’s camera to take new photos. Easy!! There are so many fun uses for this app. You can help kids make alphabet cards of their family, friends, or a family vacation. They can include recorded greetings from the people pictured! The app can also be used to make alphabet cards for another language, to teach math terms, or make holiday editions of alphabet cards. Obviously, the audience for this app is not just limited to toddlers. 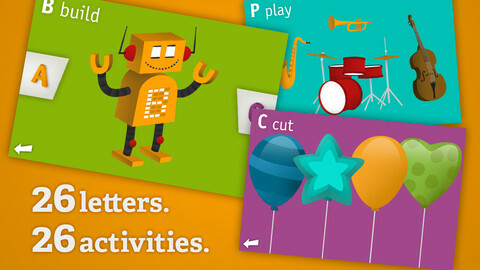 It would be fun for older kids to create their own ABC flashcards in any subject area. The possibilities are endless! 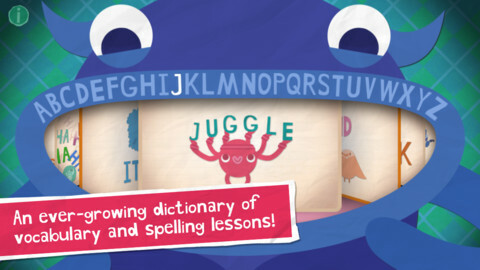 Currently $2.99 – My Beastly ABCs, an educational app featured in USA Today’s Top 10 iPad Apps for Kids. Kids join a young boy (who is reluctant to get out of bed) on a magical adventure through a not-so-ordinary day! Told in rhyme, the story recounts the boy’s day as he encounters 26 friendly monsters (one for each letter of the alphabet) from all over the world. Kids join in this interactive tale as they play hide & seek with a Boogey Monster, learn how to floss from a Vampire, uproot a Mandrake family, and much more. The app is narrated by Jim Dale with whimsical background music & great sound effects. It has 3 play modes: with narration, without narration, or auto-play. Everything about this app is top quality – beautifully illustrated with the perfect amount of animation & interactivity. There is also an index that gives kids monster facts & descriptions. Kids can read and learn about each of the beasts’ unique characteristics and place of origin. Lots of fun!! FREE again, Art ABC for the iPhone/iPad. Like all alphabet books, this educational app teaches kids the names & sounds of each letter. What makes it unique is that it also incorporates famous works of art. Each letter of the alphabet is presented on a fine art background. There is also a hidden object (with the featured letter) in the background. 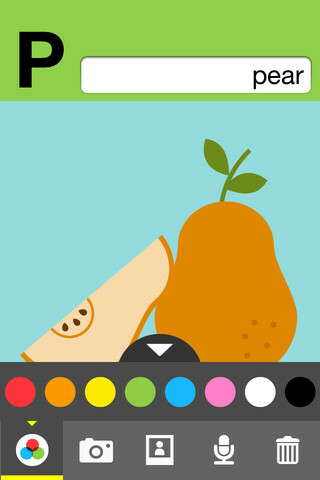 Kids explore the page by tapping to reveal each object – each in a different way! The app also contains a list of all the famous art included in the app – titles, artists, nationality, medium used, year, and location of the painting. 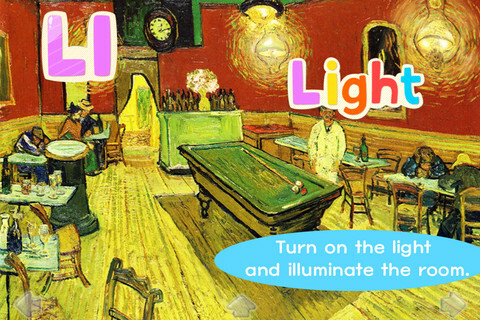 This educational app could also be used with older students in art class. Nicely done!! ABC Expedition is currently $2.99. Captain Wallace leads a tour of the zoo in this aesthetically pleasing alphabet app. The alphabet letters are placed on large buttons – easy for kids to push. Each button take the child to an animated page featuring that letter. The page contains both upper & lower case letters and an animal (with its word) that begins with that letter. The animated animals are appealing and include sound effects. GRReat! Both words and letters are pronounced when the child touches them. This app is simple but well done – love the unique color scheme! What a great app for toddlers who love animals and are learning the alphabet. Use it before or after a trip to the zoo! Keep reading my blog to find out when apps are offered for FREE.